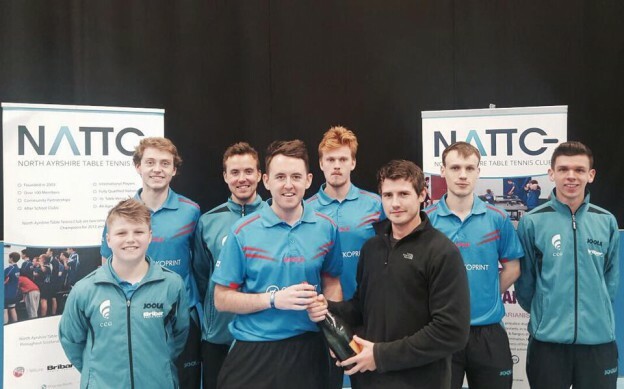 North Ayrshire got their first win in the British Premier League on Saturday, with a convincing 7-1 win versus Halton TTC. Newly signed Swedish player Viktor Gorman got North Ayrshire underway with a straight set win v Harry Watson, but Halton TTC’s no1 Richard Lighthowler levelled the scoring after a 3-0 win v Sean Doherty. The next 6 matches all went North Ayrshire’s way, Colin Dalgleish picking up two wins, Viktor & Sean winning their remaining singles match and Martin Johnson who made his British Premier League debut won his two matches in convincing style. We had a great turnout with plenty of club members and spectators coming into St Matthews to watch. With this win, North Ayrshire move up to 4th place in the league table, with all results and future fixtures available to view on www.tabletennis365.com/sbl. Next match is at Home where we play Ormesby on Saturday Nov 5th. Photos from the days match, courtesy of Ian Macpherson are available to view on our Facebook page www.facebook.com/northayrshiretabletennis.